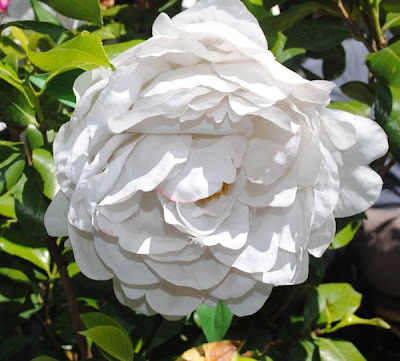 Artful Affirmations: French Friday and Giveaway! 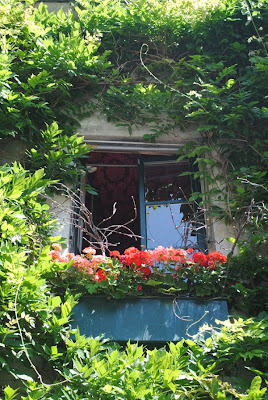 I am thrilled to be showing you more of what I experienced in France. Last week I took you on a trip through Marie Antoinette's Petite Trianon. I also offered you a free French Postcard download and a chance to win a Limoges Tea cup and saucer. You can still sign up today to win (winner chosen next Friday). Just make sure you mention in the comment that you would like to win. Now for today. I would have to say what I miss most about Paris is walking down the small narrow streets, you never knew what delightful spot you might come upon...(there seemed to be an endless supply of small narrow streets!). One day I turned the wrong way while heading to the subway and found a special place. A romantically quaint sidewalk cafe. So sweet and you could smell the delicious food. Here was a table waiting just for us! These flowers were growing in pots near the seats. They smelled heavenly! I have never seen roses like this, it was so gorgeous it was almost unreal. 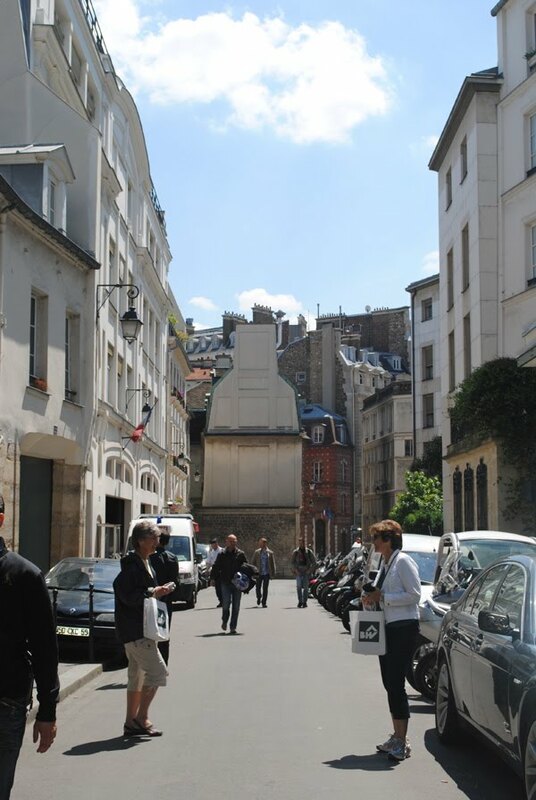 There are millions of people in Paris, and millions (it seems) of narrow streets and cafes. You would think that this would create an atmosphere of rushing, with busy people preoccupied with their lives. But it doesn't feel like that at all. It feels relaxed. It looks as if Parisians cultivate beauty. You regularly see people walking with flowers, and of course fresh baguettes. And in the evening, people are walking towards a cafe in search of a good meal and a great glass of wine. We spent a number of nights sitting at a little round cafe table with our bowl of olives, glass of wine, fabulous salad, just watching people walking by. I saw some amazing fashion, and incredible shoes! One thing I noticed right away, I never saw anyone walking in white running shoes. You know how here in America, we wear them all the time. Very sensible...very comfortable. But not in Paris, even older women wore great looking shoes. Absolutely fascinating. Here is my French Friday Giveaway! If you haven't commented yet that you would like to win it, please do so. This is a tea cup and saucer by Limoges. Very delicate. Just lovely. Oh I think I posted for this, but I'm making sure! I could use a good lift right now! Somehow I missed this sweetest of cups. My heart swoons to look at this delicate piece that reminds me of an Auntie that I adored. She loved pretty things and baked this amazing Prune Cake!! Have you ever??! Anyhow, I would love to throw my name into the teapot for a chance at such a gorgeous, gorgeous cup. What I loved about this post is that you say there is a slower pace there in Paris on the streets and at the cafes. Inviting you to savor the bliss of all the beauty. How I would love to see that here in the states. Love that window covered i ivy. My heart strings just tug when I see all this beauty. 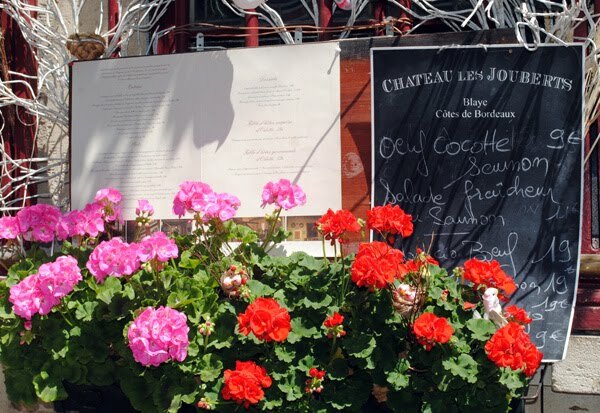 That's what I love about France too; the casual appreciation of eating, drinking, fellowship and taking time to enjoy them. I have been enjoying your French Fridays - they are bringing back lovely memories; and I would love to be included in your teacup giveaway! Reading your posts about Paris really shows how thoroughly you enjoyed your time there. 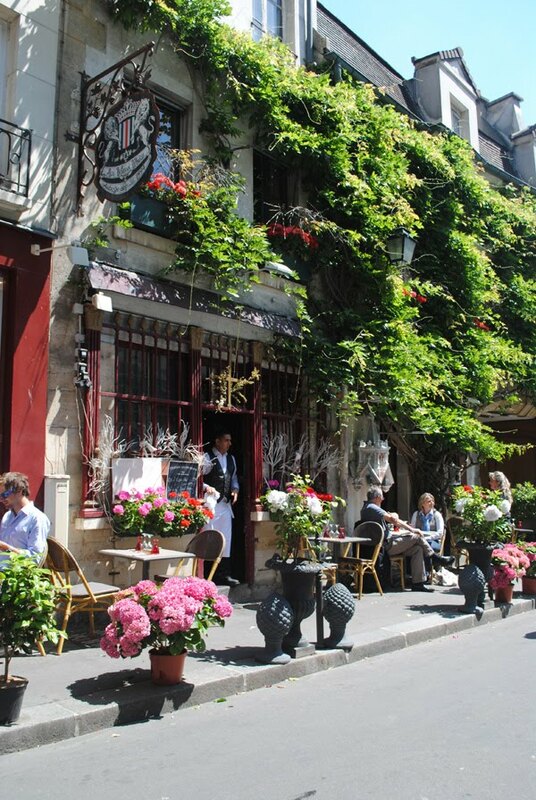 I agree the life is much more relaxed in Paris. I too noticed the local women of all ages in Italy wearing very stylish shoes at all times and never wearing white athletic shoes. Even Mr. C noticed! Have a wonderful weekend. I would love to win your give away!! I have so enjoyed all of your photos of Paris! It must have been the most marvelous trip! Oh yes, please enter me in your give-away!! What a fabulous, beautiful teacup!! And thanks for sharing your photos of France. What a life....wouldn't it be great if we all had such beautiful scenery and the life style like that? I too would love to win your delicate tea cup in anticipation of my visit to Paris in August and my hopes of walking these lovely narrow streets. 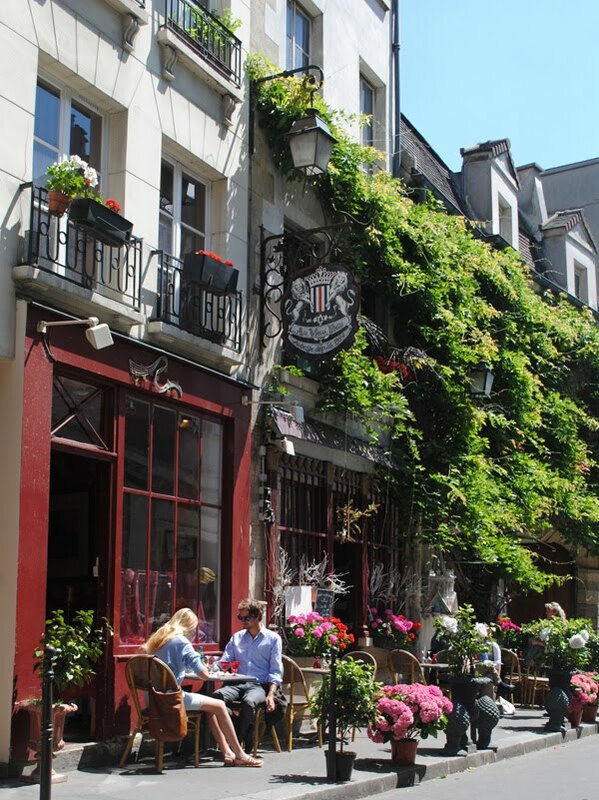 Wow, what a wonderful find that cafe was, and such a beautiful 'streetscape' - with every French theme post you're making me yearn to revisit Paris more and more. I haven't had so much time just recently to look carefully at your posts but I hope to catch up on all very soon! I am SO enjoying your Paris posts. After all, it's as close to Paris as I am likely to ever get!! I love the thought of a sidewalk cafe. So romantic and beautiful. I think I entered into the drawing last week, but if not, I'll do so now. 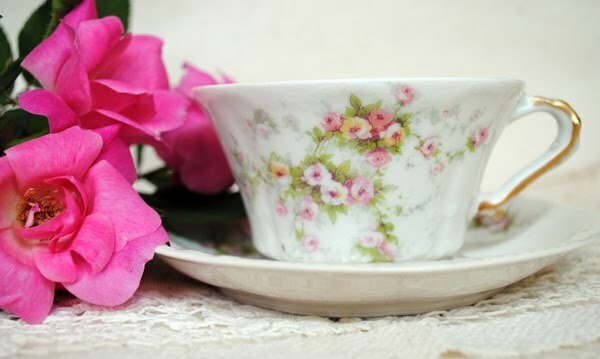 It's a beautiful teacup, and you are very gracious and generous to offer such a lovely gift to one of your blog readers. Am just loving your photos of France, wish it was closer to September as that is when I will be there...sigh. The tea cup is beautiful and I would luv to be the lucky winner. Recently I accidentally ended up in Paris, with the ashclouds and we had dinner there and walked the streets and I wished we could stay longer. I really have to go back sometime soon. Love your posts! They read so easily and are very entertaining. (Not entering for the give away). Hi Terri; I'm enjoying your photos of France; love that you made a wrong turn, what a beautiful accident to happen upon. And yes, please enter me into your Friday giveaway, I want to win. It's always interesting to read about how foreigners see us, French, while on vacation...lol....I must say i can't tell Parisians are strolling peacefully around the streets of Paris, they always seem to rush to me but i guess that when one is on holiday, one's perception of the country they are visiting may be different. have posted the following of our visit to Marie Antoinette's gardens and hamleton my blog today. Have a lovely weekend.Would love to join the draw for the giveaway ! thanks. I loved your newly posted photos. I saw Paris as a young adult, but now wish I hadn't been so young. I would have appreciated it SO much more. I appreciate seeing Paris through your eyes more than you could imagine. Please enter me in the tea cup drawing....but should you (by a miracle) draw my name, know that I will be away until July 16. Thanks. What lovely photos, and what an adventure you had! And I'd love to be entered in your giveaway, if I haven't already mentioned it. Hello...love your blog! I would love to win that beautiful teacup! Count me in! Oh, thank you so much for taking us along with you on your journey thru Paris. Your photos are so beautiful! Oh,so lovely!! I would love to have that tea cup!!!! Please count me in! I actually came for the lovely French photos and your observations about your French experiences. The fact that everyone is so relaxed and carry flowers is not new to me, but the fact that everyone wears fashionable shoes is. I fear I would never fit in. What gorgeous photos, too. I can't believe the size of that rose. Stunning. Thanks for taking us with you to France, and sharing your holiday. Would love to win that pretty teacup and saucer. I noticed, when I was overseas, that women DRESS! Nice clothes and nice shoes and purses to match. And your comment on the relaxed feeling is so spot-on! Why can't we American's learn to slow down and chill out! Your photos are georgeous Terri...the spot of red flowers is divine! Terri, your photos are so inviting. How lucky of you to be able to spend such a relaxing time. The cup is beautiful and I would truly love to be lucky myself. Thanks for sharing your wonderful vacation. your pictures are lovely.. 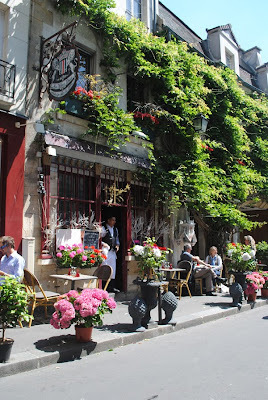 I went to Europe once and remember such places in Belgium...quaint little cafe's along the sidewalks. Nothing like that here in the states. Thanks for sharing your wonderful pics. I would love to win the tea cup!! I have one English one from my mom. I just love France and we try to get over there every year even if for a few days. This little cup and saucer is just divine. Thank you for the opportunity to win it. Your photos have brought back some lovely memories for me. wonderful post, Elizabeth sent me! great blog too! Of course everyone wants to win! such delicacy in porcelain. Of course I would love a chance to win the teacup! Your tour of Paris is making me want to visit. Oh what a lovely place you found there. The life, enjoying beauty in so many things ( shoes, fresh bread, wine, cheeses, taking time to visit with friends )seems to me to be very sensible and almost soul filling. God has made all these things for us to enjoy! Please keep writing more about your trip! Terri, I don't know if I'm too late for this but I hope not! Thank you for offering your giveaway and for your beautiful photos once again. The cafe' is charming! Look at those "pineapple" shaped sculptures along the curb! They're so unique! Love all the vines on the building! And I love the way Parisians walk everywhere buying their food every day. The image you present of them carrying flowers and bread...oh how I'd love to be there! I have so enjoyed all of your photos of Paris! It must have been lovely sitting in a quaint sidewalk cafe and just watching the people and enjoy the food. The tea cup is beautiful and I would love to be the lucky winner. HOw fun to be able to travel to a place like this and what a beautiful teacup to enjoy a wonderful cup of tea from!! Oh, how I would love to win this pretty cup and saucer set. It would add so much to my collection! love the pictures - wish I were there! Just love the idea of visiting France. Gorgeous! Hope you have a marvelous day! P.S. I would love to be entered in your giveaway if it's not too late. Alas, it is too late for me to sign up for your lovely china give away... I do so in joy your French post...I get to see Gay Paris from your eyes...to think I was so close when I was in England! 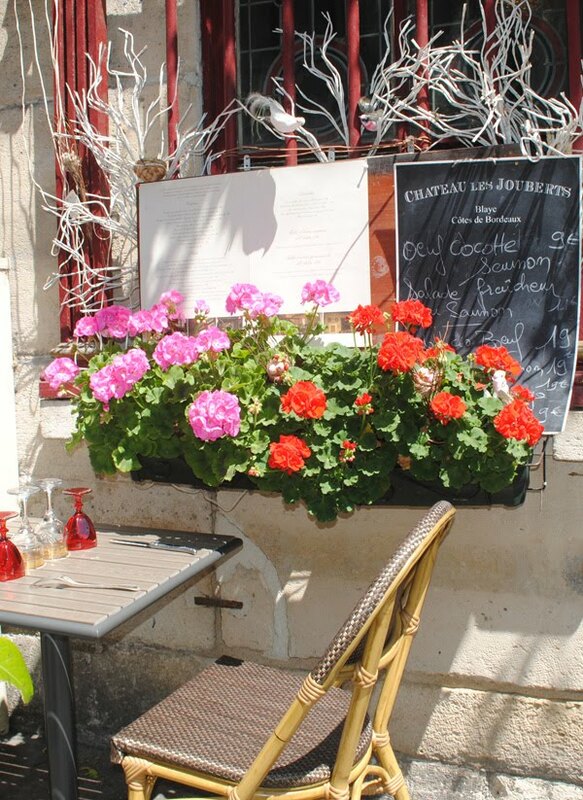 I love it all...the narrow streets,the flowers, the small table you dinned at...what did you order??? My feet are so sore with out runners how do the women do it?